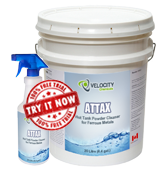 ATTAX is a powdered caustic hot tank cleaner formulated for removing rust, carbon, grease and oil, and for stripping paint. It is used by mining companies and by metal fabrication, plating, heavy equipment and engine rebuilding shops to remove rust and clean metal prior to painting or plating. Slowly add ATTAX to a partially filled container of cold water. Stir constantly. Do not add powder in large quantities. Do not add to hot water. Use at 3% to 8% concentrations at 180°F to 200°F (82-98°C). Contact time ranges from 30 minutes to 8 hours. Follow with a fresh water rinse.